* Gloves are Sold Separately. Who's the only bounty hunter in the Star Wars galaxy that's cooler than Boba Fett? Exactly, there isn't one! But in our own galaxy, your little Star Wars fan can look just like the infamous mercenary in this Deluxe Boba Fett Costume, and not even the ice planet Hoth is cooler than that! Not much is known about Fett, which is just how he likes it. We know he's a clone of Jango Fett, the legendary Mandalorian warrior who was also the model for the Republic's clone army during the Clone Wars, but he disappeared for a while after Jango fell in battle. It's also known that Boba wears Jango's former armor, is every bit as skilled and deadly (maybe even more), and is a man of few words, just like his dad. After all, one can't be a notorious intergalactic bounty hunter by blasting around space and drawing attention. He's learned to be patient and wait for the right time to capture his target. But, also like his dad, the younger Fett is really good at blowing stuff up for those times when patience doesn't do the trick! Hopefully, your little bounty hunter doesn't have to blast their way out of a tough situation while trick-or-treating, but in this awesome officially licensed costume, he'll look up to the task! The jumpsuit features built-in foam armor plates and gauntlets, and comes with a matching rubber utility belt, battle-worn cape, and helmet for extra authenticity. Get him the matching Jet Pack and a toy blaster, and that candy bounty will be all his when Halloween comes around! 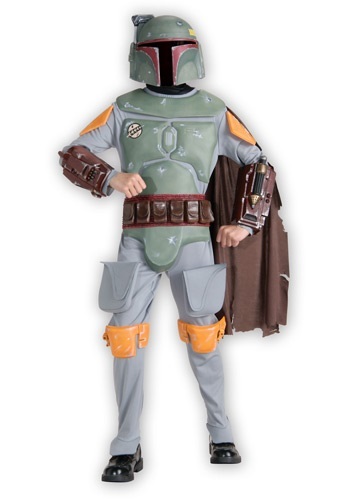 I went online and looked at a lot of different sites' Boba Fett costumes. Some of them looked really cheap and all one piece; this one looked "3D". It is pretty much exactly as pictured; I think for the price it is great. This is the one to get (not the $25 one and looks nicer than the one Costume Express has). The helmet seems good, too -- velcro keeps it closed and it covers the entire head, back and front. My almost-7 year old fits the Small (4-6) perfectly; he is small for his age, however. The service was great and this arrived right on time. I was really impressed and would use this site again. Not the best costume as it is still just cheap polyester and foam, but maybe the best out there. My son likes it anyway and I guess that's all that matters. My major gripe is that I measured my son and it told me to order a Medium, which I did, but it was SUPER small when he tried it on. So I had to call and exchange it for a Large. After paying Express Saver shipping to get it here the first time, I now had to pay another $9.00 to send it AGAIN. Frustrating! They said the price went up too, but I was able to get them to finally exchange it straight across which, in my mind, shouldn't have even been an issue.